Discussion in 'Windows, Linux & Others on the Mac' started by alex0002, Feb 5, 2015. Since we can boot a linux kernel using EFI, it should be possible to boot a Mac from USB with an EFI bootloader and update the SSD firmware without an optical drive. This EFI Boot USB method can also be used in cases where update from the optical drive fails. 1. Crucial / Micron Firmware download for M550 SSD. 2. USB flash drive (or SD card) to be formatted as a FAT32 volume. 3. GRUB-EFI bootloader files for 64bit EFI from the attachment. Download the firmware, unzip and place the ISO on the desktop. The GRUB license is GPL and is included in the zip file. The original GRUB-EFI files can be downloaded from the Gparted project on sourceforge if preferred. The same EFI Boot method can also be used to boot MicroCore linux or some other small linux system. 1. To format the USB flash drive, insert the USB in the Mac. 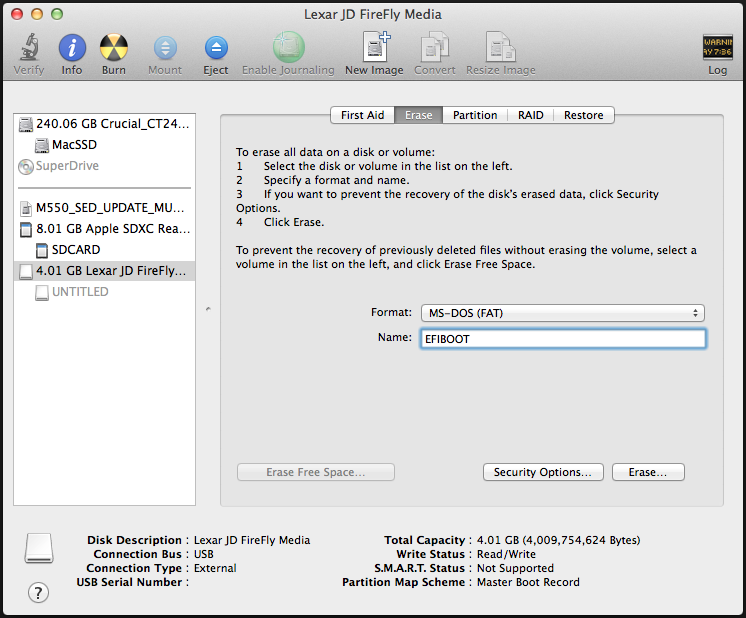 Format the USB drive as FAT32 (MS-DOS in OS X Disk Utility). The EFI folder and files should be copied to the root of the USB flash drive. 4. Install the Crucial / Micron firmware update folders to the USB. Now copy those folders and files to the root of the EFIBOOT USB. The files provided in the cde folder of the Crucial/Micro download, do not appear to be used in the M550 MU02 update, but there is no harm in having them on the USB. This is an optional step and should not be needed in most cases where the USB uses an msdos partition table. There might be some EFI/UEFI implementations where this is required. In a few seconds, Startup Manager appears and you can select the EFI Boot USB device. The M550 FW update option will update the firmware with no need for user input. The Micro Core Linux option can be used for troubleshooting, but the macbook pro keyboard and some other Mac keyboards might not work. You will need to use a generic USB keyboard. More info on the M550 MU02 firmware update can be found in M550 MU02 thread on the crucial support forums. 1. Previous Crucial/Micron firmware updates for the M4 and M500 SSDs used a FreeDOS based update that could not be booted from a pure EFI/UEFI environment. typerror, serialtoon, jf.blanco and 3 others like this. Some additional info that didn’t belong the main post. The instructions above are for a 64bit EFI Intel Mac. To use this same method with 32bit EFI, a 32bit EFI bootloader would be needed. This can be downloaded from the Gparted project on sourceforge. This hasn’t been verified, as I don’t have the older 32bit hardware needed for testing. what am i doing wrong? i followed instructions except #5 but when i restart i only see "Micro Core Linux with waitusb=10 and superuser", the second choice "Micron Storage Director M550 FW update" is missing. The fact that you got to see Micro Core Linux with waitusb=10 and superuser means that you successfully created a bootable USB and for some reason didn't get the second boot option. I suspect that the most likely reason is that somehow the grub.cfg file got corrupted. Please make sure that when you check/edit the grub.cfg file that you only use a true ascii editor. If you don't want to use a terminal based editor like vim or nano, then consider using something like TextWrangler from the App store. # Please note: using GRUB to boot the Micron firmware updater is unsupported. # Use this option at your own risk. # Using GRUB to boot the Micron firmware updater is unsupported. Perhaps you could copy/paste the simple one above and try that. Edit: I've just tested the simple version of grub.cfg (above) with a 2011 MBP, but since this machine doesn't have a M550, I'm only able to confirm it boots and show the option "Micron Storage Director M550 FW update". Then when the firmware updater runs, it finds no M550 and the message "No drives needing update...." is seen before rebooting. Note: There is also new firmware for the Crucial MX100 which will need a new grub.cfg file and I will post an update about that one soon. I re-downloaded everything and it worked. Thanks for the assistance! There has been a new firmware release for the Crucial MX100 and the procedure for booting the firmware update tool is the same as with the M550. 1. Crucial firmware MU02 download for the MX100 SSD. Follow the general instructions as per the original post for the M550. The files installed under boot come from the Crucial/Micron MX100 firmware download. Boot from the USB and when the GRUB bootloader runs, the GRUB menu can be seen and the user can then select the preferred boot option using the up/down arrow keys. The MX100 FW update option will update the firmware with no need for user input. This EFI bootable USB update has been tested with a Gigabyte Z77-D3H UEFI motherboard, which successfully updated an MX100 512GB SSD from MU01 to MU02. This was also tested with a late 2011 13-inch MBP, just to confirm that it booted and displayed the grub menu, but since the SSD was not an MX100, the firmware update could not be verified. Please let me know if this works or if you have any problems. tomazo, WordSands, Eligos and 2 others like this. There has been a new firmware release for the Crucial BX100. The procedure for booting the firmware update tool using an EFI bootloader is the same as used with the M550 and MX100. Please review the instructions for M550 and MX100 in the previous posts. 1. Crucial firmware MU02 download for the BX100 SSD. That one is configured for the MX100 and we can update the grub.cfg file for the BX100. Follow the general instructions as per the previous messages for the M550 and MX100. The files installed under boot come from the BX100 firmware download. Make sure that the grub.cfg file and downloaded firmware are matching (both should be for the BX100). The BX100 FW update option will update the SSD firmware with no need for user input. Once again, Ive been able to check that a Macbook Pro and a UEFI pc can be booted from the USB. Since I dont have a BX200, Im not able to confirm the firmware update itself. Thank you very much for this. Just updated the MX100 in my Mini successfully - worked like a charm. I upgraded a few MX100 drives on MacPro5,1 without any problems. On MacPro3,1 update was initially failing with error 13, but disconnecting ATA/IDE DVD drive helped. Booting from CD was failing the same way by the way, so using USB was the only way to perform the upgrade. Thanks alex0002! After much frustration trying to update via CD, I used this method to update a Crucial MX100 512GB SSD in a Mid-2010 MacBook Pro. Appreciate the clear instructions! I spent hours with usb drives and my external superdrive, nothing worked. I'm glad I was able to help. I should really write a troubleshooting section, but the only problems I've seen or heard about have been (i) error 13 during the update process and (ii) twice when testing with a Gigabyte UEFI motherboard, I found that the USB was not detected as EFI bootable. I suspect the USB not detected as EFI bootable might be caused by having other files on the USB and I had moved/replaced them, instead of starting with a freshly formatted USB. During boot up, there is a very short period of time available for the system to read each disk and determine if the device is EFI bootable or not. This problem was solved by a clean format of the USB and installing just the files needed. In some cases when creating the USB on a Mac, it might be advisable to disable Spotlight indexing. Or if available, create the USB on a linux or windows pc that won't write a whole bunch of useless files. The other suggestion is the one you found. If possible, disconnect all drives that don't need updating, including the optical drive. Thank you very much for your Crucial MX100 tutorial. After looking on the Crucial site for answers to my USB or CD-R update not working, I found your posts and all went well. Thanks, this just worked great on a 2011 MBP and m550. Anyone know if it's safe to turn on trimforce now? Do you mean in 10.10.4? Sure, should work great. This all seems to have worked perfectly on my mid 2010 Macbook pro, but can anyone tell me how I might check to see that the MU2 is, in fact, on my m550? Thanks for the info, it works - I did find out that you cannot update a second machine from the same USB stick unless the hidden Spotlight files were deleted or a fresh format and creation of the stick contents. And to check that the update has been done go to About This Mac - System Report and check out the SATA/SATA Express entries - it will have firmware number in the Revision entry for the Crucial drive information. Brian33 and alex0002 like this. What sort of Mac are you trying to update and which version of the EFI boot files did you download? Some older machines might have 32 bit EFI and that won't work with the files in the zip file. Note: some of the machines with a 64 bit CPU had 32 bit EFI so you might need to check the specifications rather than assuming 64 bit EFI from the CPU type. If you have 32 bit EFI then take a look at post #2 in this thread. Once you've confirmed that your machine uses 64 bit EFI, then the main suggestions I can make appear to have already been mentioned, but perhaps some of these might help. 1) download again - perhaps something got corrupted. 2) start with a fresh formatted USB flash drive or SD card. 3) In gparted there are a couple of different options, (i) the drive can be partitioned with MSDOS partitioning or, (ii) using GPT. Try both and if you use GPT you might need to mark the partition as both Bootable and ESP. 4) Try several different USB drives. 5) Try a Firewire drive or bootable Thunderbolt drive if you have them. Can you boot OS X from an external drive? If your hardware/firmware is good this should be possible and could help you determine if the problem is the Grub based bootloader or something common to all external drives and all bootloaders. If all else fails you might need to try another method, such as rEFInd or the earlier rEFIt boot manager. Dear lord, what an ordeal this was until I found your tutorial. A thousand thanks for this as Crucial seemed determined on making this nearly impossible, unless you had a superdrive. Now I'm bracing myself for the next firmware update on my MX 100 which I hope isn't needed anytime soon. Anyway, thanks again for this. Great work! Hi, I have a mid-2007 iMac (iMac7,1) with a damaged superdrive unit so this is why I'm relying upon the usb method --- I downloaded the EFI files you posted (grubefiusb-0.03.zip & grubefiusb-0.03-p02.zip) and followed your instructions carefully, replacing the necessary files --- not sure if my EFI is 32 or 64 bits ... how can I know? I just especially looked for this thread as i stumbled upon it last friday. I was also getting the Error 13 message and the tutorial was immensely helpful! Thank you so much! I was a Little scared when i first skimmed through the instructions but once i actually went through with the update i couldn't believe that it was THAT simple - and quick! Burning the CD took longer than the modifications in this tutorial. So, thanks again, update worked like a charm, my SSD is now rocking MU02 and trimming like a Boss! Hi Alex, please, I am desperate. I need to update my M4 firm so I am suffering the bug I am have freezings every hour.. I don't have superdrive on my MBP because I remove it to install the M4 SSD. I tried to do it via USB but after tried and read a lot of hours I couldn't do it. Please, it is any way to update it?